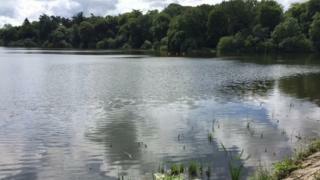 Dozens of fish have been found dead in a lake in County Down. People in the area surrounding Hillsborough lake reported seeing the dead fish in the water. The lake had been restocked with 1,000 rainbow trout on Wednesday. The Northern Ireland Environment Agency (NIEA) has been examining the area on Thursday. "No pollution has been noted, and other environmental factors may be responsible," they said. "Fish mortalities currently comprising hundreds of dead sticklebacks and a small number of trout have been confirmed, and more trout are under stress." In a statement, the Department of Culture, Arts and Leisure (DCAL)said the lake had been restocked following environmental monitoring of the site by staff that indicated that water quality parameters were within acceptable ranges. "The stocking was also facilitated in response to increased pressure from the angling public due to previous stockings having been postponed in recognition of environmental concerns," the department said. "All fish stocked are sourced from the department's fish farm at Movanagher, where both fish welfare and environmental conditions are continuously monitored." DCAL staff are currently at the lake, where there are signs warning about the water quality as there is a naturally occurring toxic algae present that multiplies in warm weather. It can reduce oxygen levels in the water and may be one reason why the fish are dying.